18 June 2011 – Dagupan City. 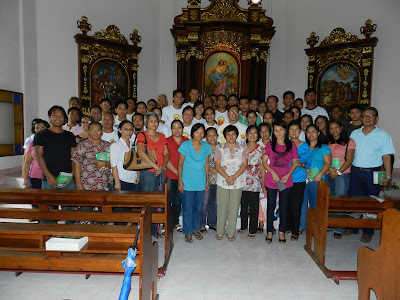 Ten lay leaders from the Parish of St. Fabian, Pope and Martyr, together with the other lay leaders from the different parishes of the Archdiocese of Lingayen-Dagupan,completed their modular studies given by Archbishop Socrates B. Villegas, Archbishop of Lingayen-Dagupan, last 18 June 2011. The modular program centered on the Spirituality of Stewardship. Fr. Oliver E. Mendoza, parish priest of San Fabian, was full of optimism for the lay leaders who had just completed the modular program. “They will form the nucleus of the ‘Stewardship Committee’ of the parish”, he said. Fr. Mendoza also said that the group will be responsible in bringing the Spirituality of the Stewardship to the parish. The group has been meeting several times to map out the parish stewardship program. “The stewardship is a must in the parish especially with the planned phase-out of the arancel system in the Archdiocese”, Fr. Mendoza further said. The ten lay leaders who completed the Stewardship modular program are: Sisters Rosalia P. Edic, Carmencita D. Chua, Julieta C Soliven, Violeta A. Omiles, Gloria Euslan, Fritzy M. Narvas, Bros. Antonito Supremido, Marvin Borja, Felipe Dagarag and Joey Estandarte. In a Circular Letter issued by Archbishop Socrates B. Villegas on 20 January 2011, the gradual phase out of the arancel system was laid out for the whole archdiocese. “Our collective discernment to gradually phase out the obligatory table of offerings for the administration of the sacraments and sacramentals is a positive step in the right direction. Our target date for the full phase out of the arancel system and our active engagement in the spirituality of stewardship is the golden jubilee of the Archdiocese of Lingayen Dagupan on February 16, 2013”, he wrote in his circular. “We cannot pursue this pastoral goal without catechesis. We cannot reach our stated goal without a process of conversion and a change of pastoral paradigms. The phase out of the arancel is not a money issue. It is a deeply spiritual matter. We need to change our understanding of the Church from being a stone building or a service agency to a community of disciples called by Jesus, formed by Jesus and sent by Jesus”, the letter further said. The Arancel System is the traditional system of Church support. It follows a fixed amount from the faithful as their support for the church. This system centers on the sacramental services being offered by the church in which a fixed ‘fee’ is asked from the faithful. With the phase-out of the said system, there is a need to find a new way of supporting the church in her mission and apostolate that is not focused on the monetary amount, but more on stewardship as a way of life. This new way of system of church support must flow from the generosity of the people as stewards of God and the Church. It must also provide for a structure by which the faithful can give their support regularly in an orderly, systematic and transparent way. Pope Benedict XVI was ordained a priest on 29 June 1951. It is very fitting that the the adoration will end on 1 July, the Feast of the Sacred Heart of Jesus and Day of Prayer for Priests. The intention proposed by the Congregation for the Clergy, according to L'Osservatore Romano, the official Vatican Newspaper, is the sanctification of priests and to obtain from God the gift of new and holy vocations. According to Zenit, an international news agency, Cardinal Mauro Piacenza and Archbishop Celso Morga Iruzubieta, prefect and secretary of the congregation, note that the anniversary is a "particularly propitious" occasion to draw near to Benedict XVI, and to express to him gratitude, affection, and communion in the service of God and his Church and, above all, in that "shining of the Truth on the world," which he calls us to. The 60-Hours of adoration will be distributed to all the parishes and schools of the Archdiocese of Lingayen-Dagupan. Each parish and school will be given a one-hour adoration each. The Congregation for the Clergy also proposes that in addition to praying for the Pope's life, health, happiness and protection from every evil, the faithful are asked to pray for bishops, priests, deacons and all ministers of the Gospel, that they may be faithful to their vocation and their self-giving, and to remember the Church, vocations, the laity and deceased priests. The Parish of St. Fabian will have its one-hour adoration at the Sanctuario de San Juan Evangelista on 29 June 2011, Wednesday, from 6:00 AM to 7:00 AM. The Archdiocesan School of San Fabian will have their adoration on 30 June 2011, Thursday from 10:00 AM to 11:00 AM. All the religious organizations and movements, and the different cenacle communities are enjoined to participate in the adoration. Assembly area will be at the church patio at 5:00 AM. 18 June 2011 – LFC, Dagupan City. Archbishop Socrates B. Villegas, DD, the Archbishop of Lingayen-Dagupan, formally announced the composition of the recently constituted Archdiocesan Council of the Laity, locally known as OLUPAN NA LAIKO – ARKIDIOSIS NA LINGAYEN-DAGUPAN, during the meeting of various lay representatives of the parishes of the Archdiocese of Lingayen-Dagupan. Bro. Antonio Supremido was chosen by Archbishop Villegas to become the first Lay Coordinator of ONLA-ALD. Supremido is presently the BEC Parish Coordinator of San Fabian and the Parish Social Action Lay Coordinator. He heads the Apostles of Divine Mercy, the vehicle organization of the parish in building the small communities, or cenacles, in the barangays. In his Easter Sunday Circular Letter, Archbishop Villegas laid down the rationale in constituting the ONLA-ALD. The other members of the ONLA-ALD chosen by the Archbishop were: Sis. Susan Aoanan (Worship), Bro. Marcelo Vistro (Education), Sis. Janice Hebron (Services), Sis. Silvana de Vera (Temporalities) and Bro. Dennis (Youth). (Dado Gerard C. Vallejos is a contributor to the Parish Website. He is at present a member of the Ministry of Social Action (MISA) of the Parish and the Barangay Coordinator for the Hapag-Asa Feeding Program of the Parish. He is also a Teacher -I in Longos Central Elementary School. 11 June 2011 – Dagupan City. The Biblical Apostolate of the Archdiocese of Lingayen-Dagupan in cooperation with the Episcopal Commission on Biblical Apostolate (ECBA) and the Philippine Bible Society (PBS) recently launched the Pangasinan Handwritten Bible last 11 June 2011 at the Sanctuario de San Juan Evangelista, Dagupan City. Besides Bishop Renato P. Mayugba, the launching was attended by Archbishop Socrates B. Villegas, the Archbishop of Lingayen-Dagupan, Msgr. Jesus A. Cabrera, Bishop-Emeritus of Alaminos, civil and religious leaders and representatives from the different Protestant denominations. The Handwritten Unity Bible (HUB) will need around 35,000 individuals to write each verse of the Bible in English and the same number for the Pangasinan language. The 35,656 verses from 78 books of the bible will be written by hand by representatives from various sectors such as the Church, urban/rural poor, OFWs, youth, farmers, government offices; schools, indigenous people, and the fisher folks. The project was launched in Dagupan City with a motorcade on 10 June 2001, a day before the formal launching, from the St. Therese Church in Rizal St. to the Sanctuario de San Juan Evangelista where the transcription took place. San Fabian – The Parish of St. Fabian, Pope and Martyr, held recently another Parish Renewal Experience (PREX) Weekend Seminar lats 3-5 June 2011 at the Parish Center. The Parish Renewal Experience has been the primary formation program for adult Catholics of the parish. It has been held in San Fabian since 2004 when it was first introduced in the parish by Rev. Fr. Francisco Ungria, Jr.
10 June 2011 – Dagupan City, Lay Formation Center. The personnel and office staff of the Parish of St. Fabian, Pope and Martyr, attended a one-day recollection at the Lay Formation Center, Bonuan Gueset, Dagupan City. The recollection is given annually to the personnel, secretaries and sacristans, as well as members of the household staff of the Parish Rectory. The recollection is based on the Basic Bible Seminar (BBS) with the aim to discover the Word of God in their humble work. A free MTBO Bible was given to the participants. Most Reverend Renato P. Mayugba, DD and Fr. Mario Sanchez, the LFC Director, celebrated the Holy Mass at the closing of the affair. The recollection started at 8:00 AM with the recitation of the Holy Rosary. It ended at 4:30 PM. The Lay Formation Center of the Archdiocese of Lingayen-Dagupan has been giving formation seminars, recollections and retreats to various lay groups and associations, as well as to students and school personnel. The Lay Formation Center (LFC) was established by Archbishop Oscar V. Cruz and the Clergy of the Archdiocese of Lingayen-Dagupan for the formation "especially of the laity." It opened on the feast of San Lorenzo Ruiz de Manila, the first Filipino Saint, who is a Filipino and lay person on September 28, 2005. San Fabian, Pangasinan - MONTESSORI CLASS–The students who completed the 2011 Summer Programs (6-week "Creative Fun Learning Montessori Way) under the auspices of the Archdiocesan School of San Fabian, gather for a class picture with their instructors on "graduation day". (Front row, left to right) Guian Estrada, Jomar Fernandez, Paul Gagute, Mario Abrio III, Lawrence Velasquez, Harvi Marmotejo, Jamir Nicer. (Second row, left to right): Irish Malanum, Chelsea Ramos, Ema Abrio, Khristine Recto, Juliana Villanueva, Abby Abrio, Ishi Rivera, Lillain Gubatan, Sherry Ann Narvarte; (Third row, left to right): Instructors Mary Grace Lalata, Sheena Lomandas, Josie Garcia, Montessori Director; Leonardo Carrera, ASSF principal; Jennifer Farro, and Vine Pandy. (Not in photo is Zachary Fabia). The participants were taught papier-mâché art, Language & Math. The Montessori program was directed by Ms. Josie Garcia, American Society Educator-Consultant and Art Educator on programs designed for teachers, parents and children. San Fabian. The commissioning of the different Lay Ministers of the Parish of St. Fabian, Pope and Martyr, will be held on 12 June 2011. It will be done during the third mass of the day at 8:00 AM. In a circular letter written by Archbishop Socrates B. Villegas, DD, he reminded all the parish priests that “the Commissioning and Renewal Rites of Lay Ministers of the parish must be done during the Principal Mass of the parish on Pentecost Sunday.” This year, Pentecost Sunday will be on 12 June 2011. The Lay Ministers to be commissioned are Extraordinary Ministers of Holy Communion, the Lectors and Commentators, Liturgical Ushers, members of the choir, as well as the Catechists and the Social Action Ministers.